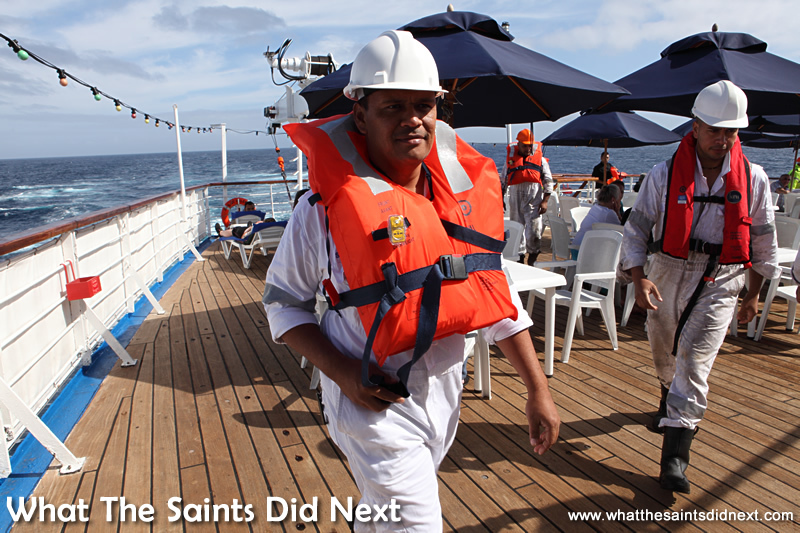 Back to our five day voyage on the RMS St Helena, travelling from St Helena Island to Cape Town, South Africa. As I mentioned in Part 1, anyone who’s travelled on the ship will be able to identify with some of those highlights, as well as have their own. Mine is by no means a unique claim, but just my personal highlights of this one voyage. Hotel services team muster on A deck. 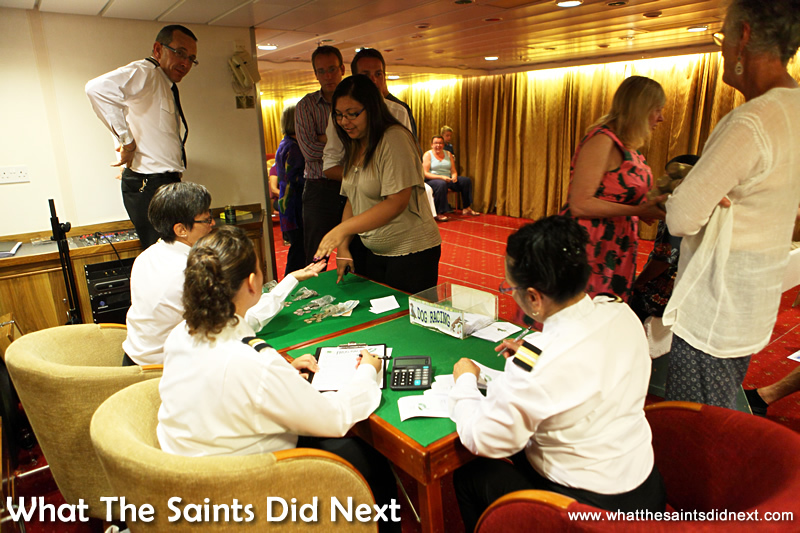 The RMS St Helena has a perfect safety record but it’s still reassuring to see the ship’s company carry out very regular emergency drills. It’s day 5 of the voyage and today there’s a drill. We have been warned a few times it’s happening and to ignore the commotion; passengers aren’t required to participate, “and should ignore the ringing of the alarm bells” at this time. On cue, the ship’s alarm starts ringing loudly throughout the ship, then a voice on the PA: “For exercise, for exercise…” followed by an explanation of the simulated emergency underway. 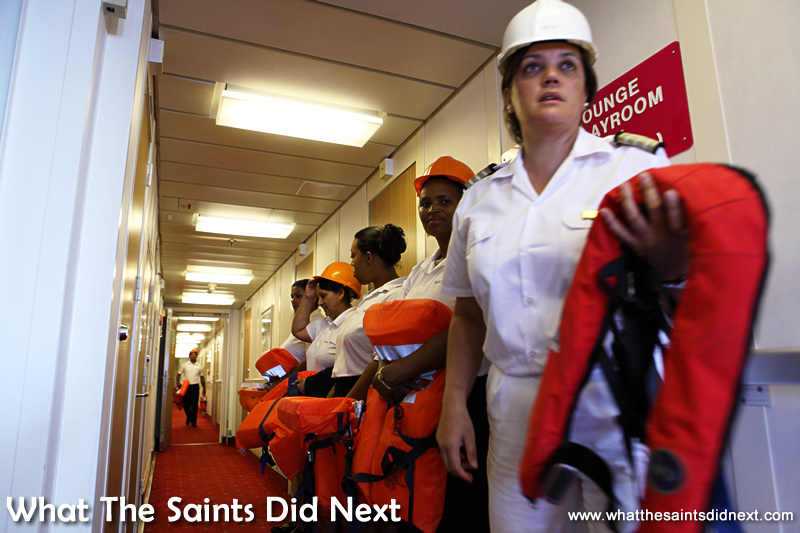 After a few minutes another order is given, for the ship’s company to “withdraw to boats.” On the sun deck it’s certainly an interesting moment seeing a stream of officers and crew all heading for the lifeboats and wearing their orange life jackets. Thankfully this was no more than a drill. Crew make their way to the lifeboats in this drill. Head count at the lifeboat station. Dinner being served at our table. 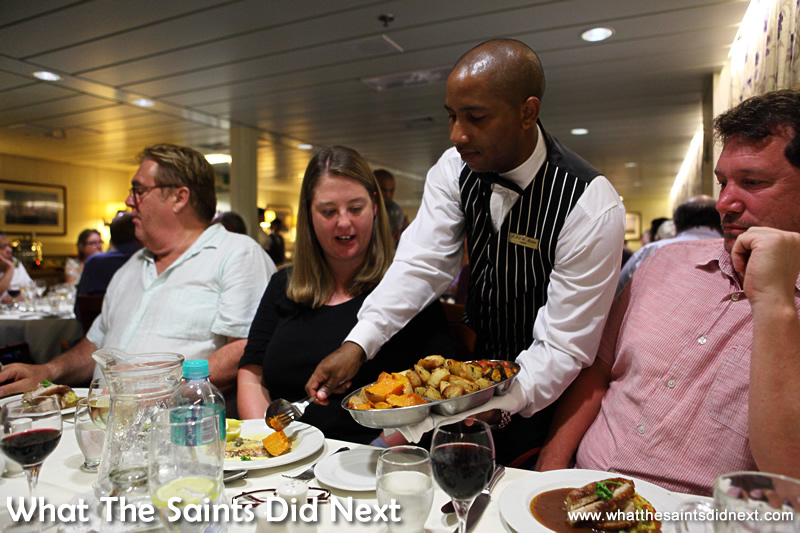 The best part of this whole voyage has been dinner each evening in the dining saloon. In great part this was down to the food, but most especially it has been the company of our four dining companions. Alan Floate (returning from a one week visit to St Helena), Mike and Sabrina Harper (catering and hospitality trainers working on the island), and Sharon and I. Our sixth member alternated each night between Second Engineer, Merrill Lawrence and Chief Officer, Adam Williams. From 8pm until well after 9.30 each evening was a great laugh. We would always start by asking each other what we’d been doing that day! You would think we had all been on different ships during. There was never a quiet moment and the conversation flowed. There were sometimes groans of mock disappointment when our menu selections were served and we thought someone else’s choice looked better. Perhaps the most amazing story from our table revealed itself during the first evening. Alan had spent a year working on Ascension Island in 1983/4 when Fairclough International had built the RAF camp. 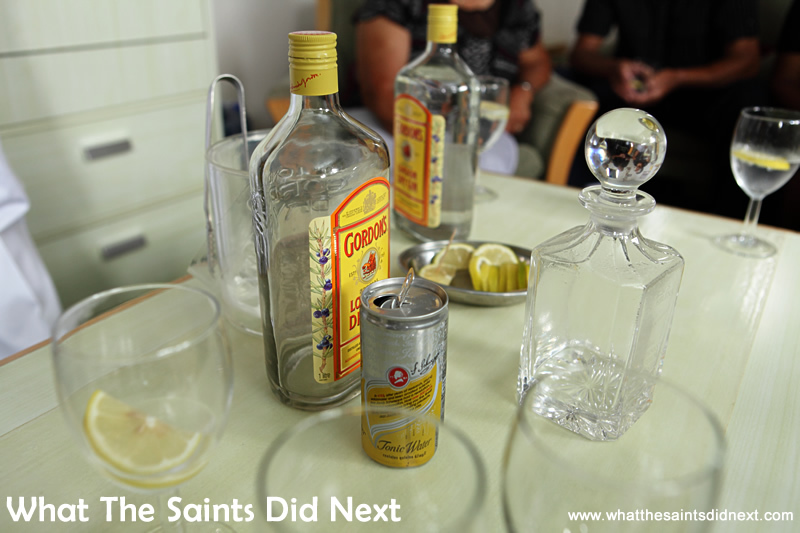 While there on a few occasions he had visited a St Helenian family with two boys. 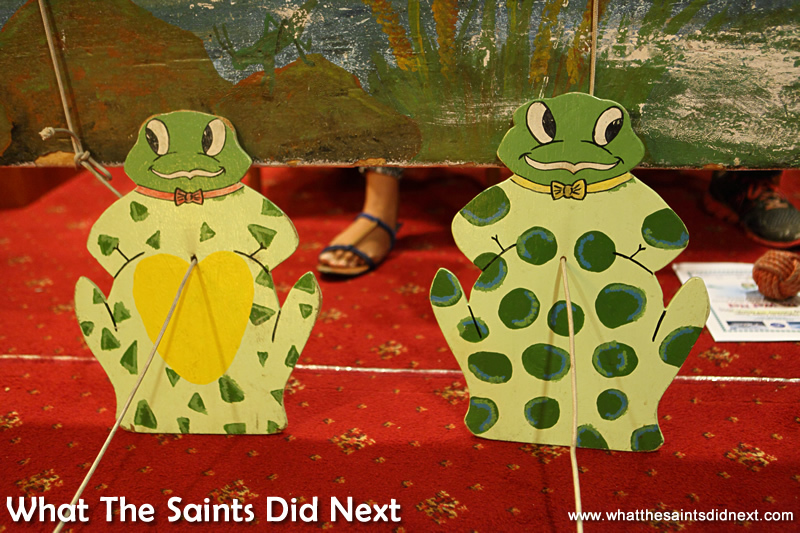 As the conversation wound on, we realised the family was mine; I was one of the two boys. My mum had also worked for Fairclough, hence the connection. 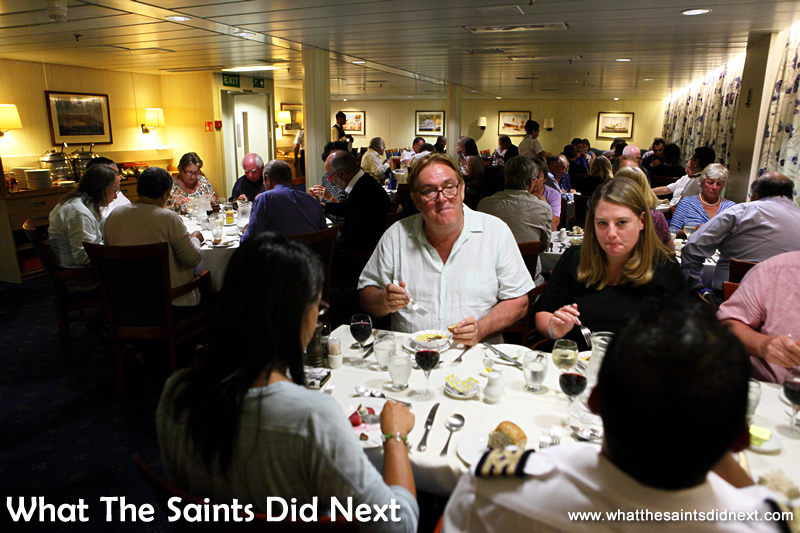 Of all the coincidences, more than 30 years later we just happened to be seated together at the same table on the RMS St Helena. 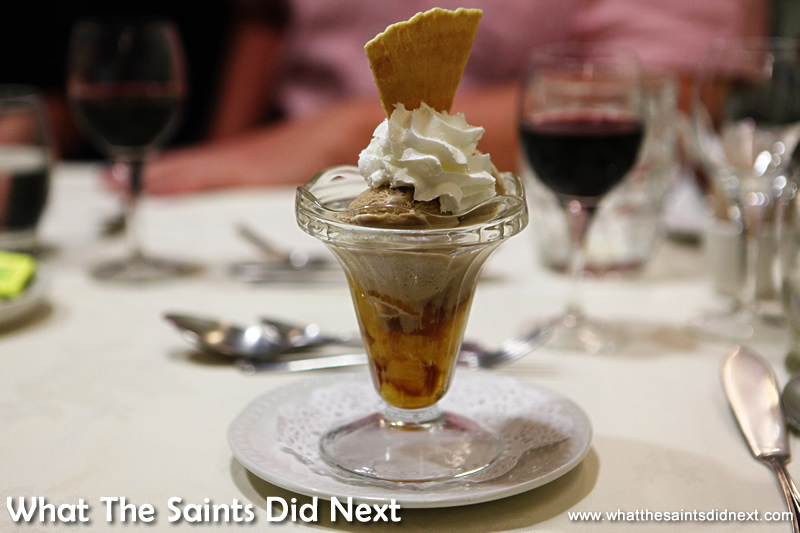 A long standing tradition on the RMS (or is it all ships?) 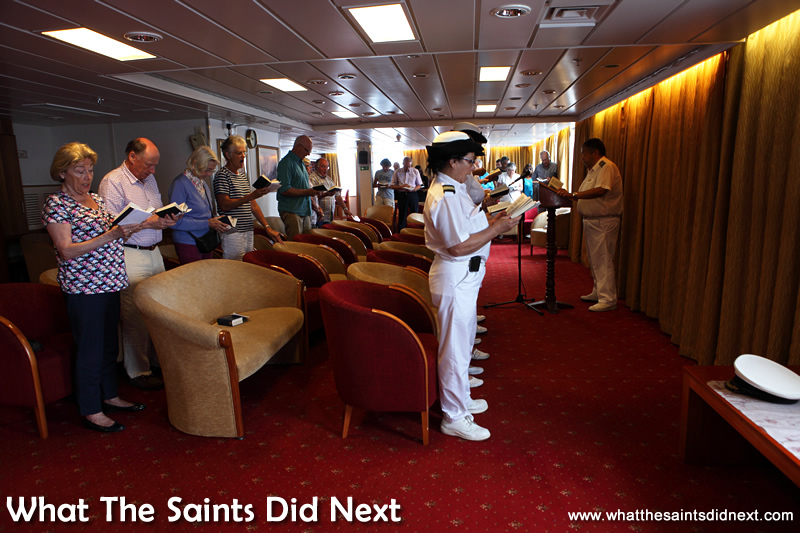 is a church service on Sunday mornings when at sea. 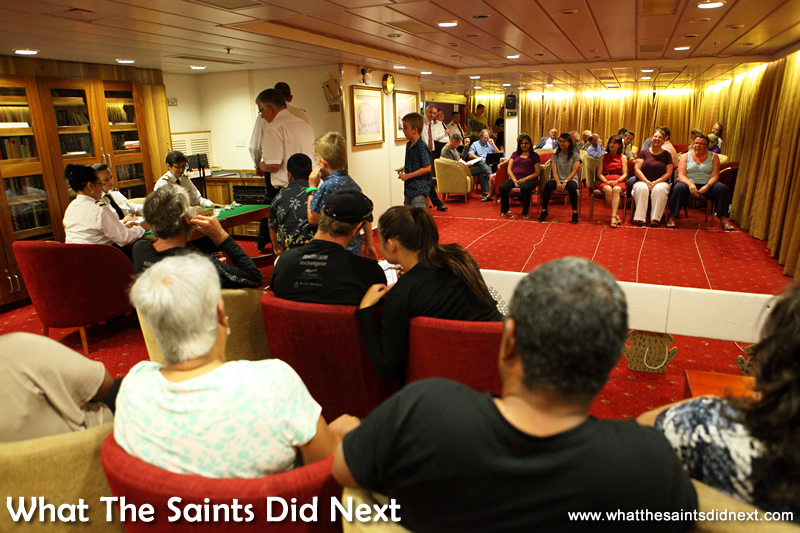 On this voyage Captain Rodney Young conducted the service in the Main Lounge with both officers and passengers in the congregation. Backing tracks for the hymns are played from CDs which helps keep everyone in good voice. Helpful also in masking my tone deaf efforts! Church service in the main lounge. Captain Young playing host after church. Everyone settles back to watch the ladies race. 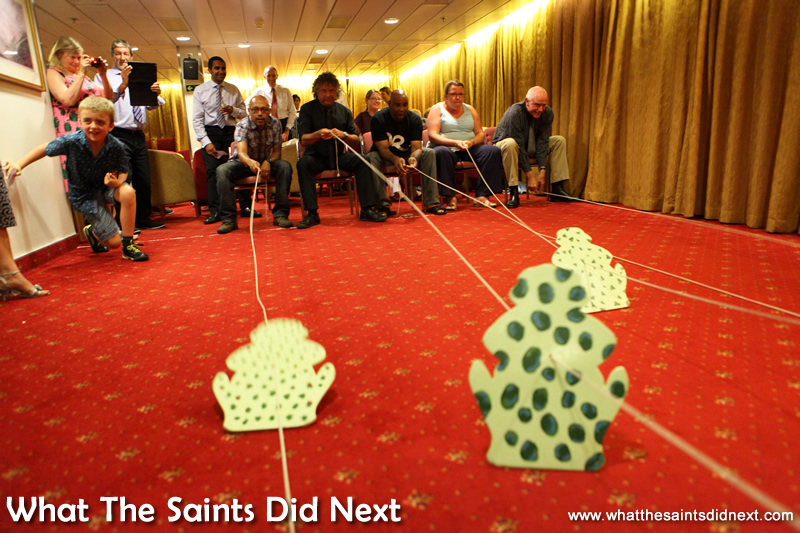 Nothing typifies an evening on the RMS St Helena quite like frog racing. Over the years my opinion has gone full cycle: enjoying frog racing nights, bored with it, hoping it would be replaced and now, on the last night of the voyage, loving the fact that frog racing is wonderfully familiar and just as much fun as ever. It’s become a tradition that’s older than the ship itself (yes, it is possible) and now it wouldn’t seem right without it. A 20p tote adds a little extra spice to the fun and Sharon and I finish the night nearly £7 to the good. Five passengers are selected for each race; we both get a turn. Sharon loses out in the ladies event but I storm home in my race which puts me in the grand final. But there’s a twist at the start of the final! Downing a gin and tonic. Fellow passenger Keith Yon and I finish neck and neck which means a sudden death play-off. I get a good start and finish first. Yep, I definitely like frog racing. Here I am winning my heat. 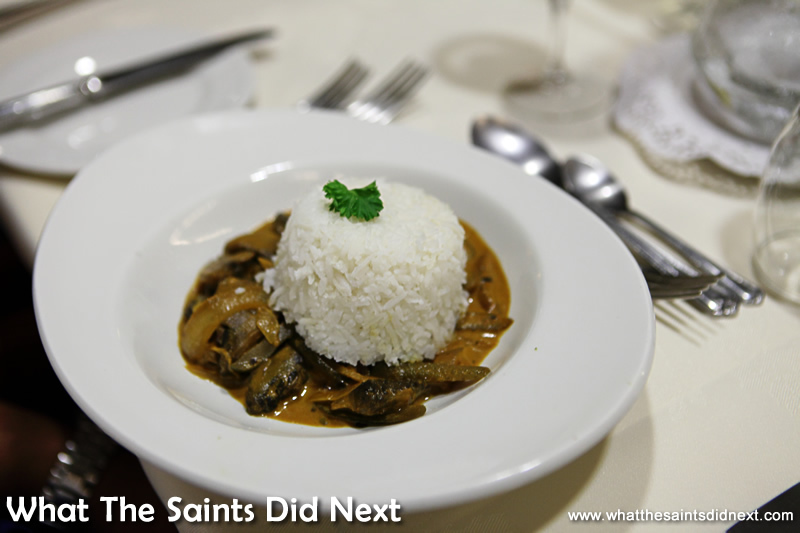 Our days at sea have revolved around food; delicious, well presented meals, three times a day. Plus there’s four o’clock tea and cakes. And even coffee (or tea) served in the cabins first thing in the morning if we choose. There are two venue options for breakfast and lunch: sun lounge or dining saloon. The sun lounge is normally a lighter, buffet style meal; continental breakfast and salads, while the dining room is a little more formal, served by attentive stewards and stewardesses. Dinner is served in the dining saloon only with two sittings to accommodate the numbers onboard. Seating is fixed, with tables allocated by the hotel services team before we board. Breakfast and lunch on the other hand has an open seating plan, which is a great way to socialise with different passengers onboard. 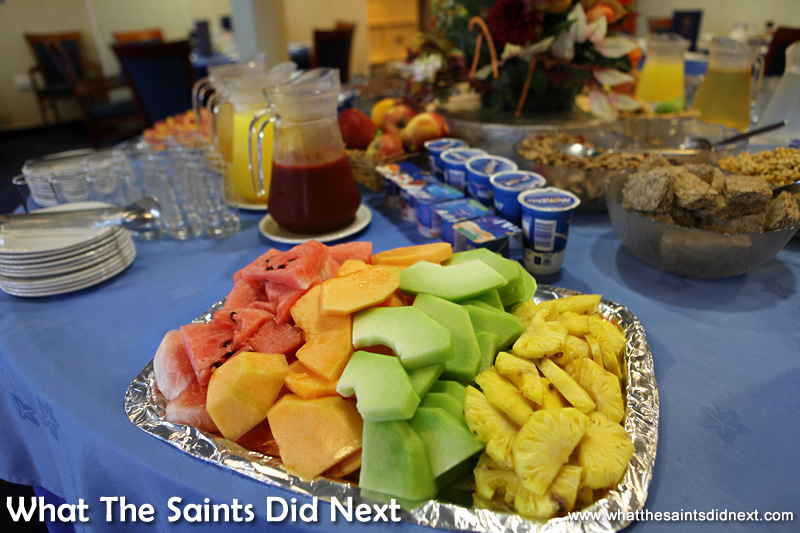 The breakfast buffet in the dining saloon. 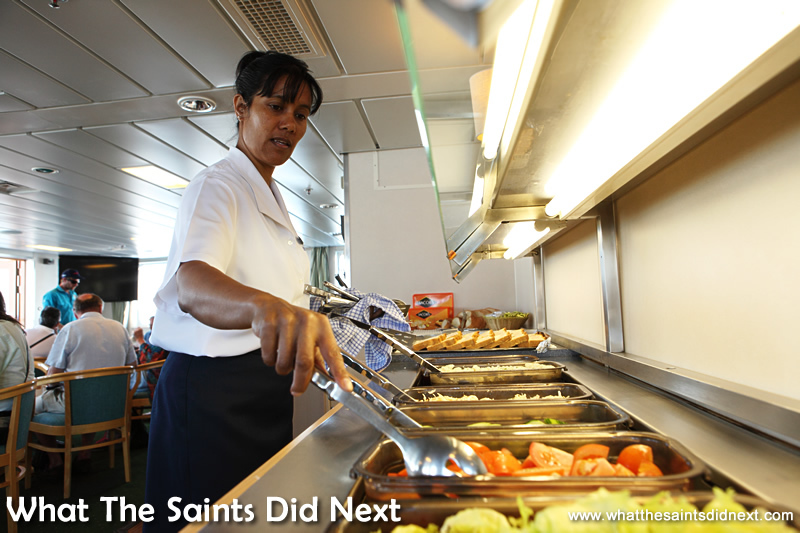 Stewardess Charmaine preparing the lunch buffet in the sun lounge. 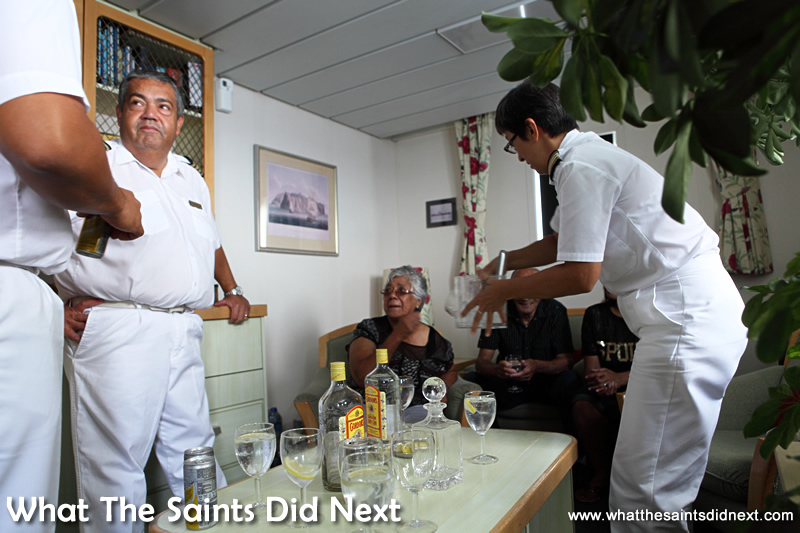 My Top 10 Highlights from voyage 221 on the RMS St Helena. Do you agree with any and what have been yours? When you are on the RMS it is like the rest of the world exist. All that matters is those you are traveling with. Strong friendships are made. Nothing nicer than not having to worry over anything just looking forward to afternoon tea or the next meal or what entertainment is on. I loved siting on deck just sailing along. Brilliant!!! Will sure miss this great ship and the lovely crew how i wish we could still have this special ship to take us away when we like to go to see the other side of the world and just enjoy the peaceful and relaxing time spend on this wonderful ship.All the very best to the great crew on board !!!!!! You are all so special. The food is excellent !!!!!!!!!! 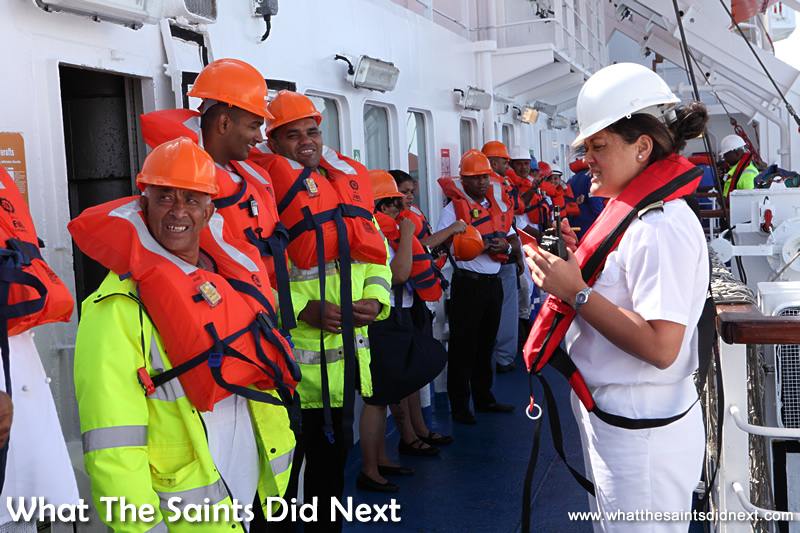 Liked the life boat drill and remembered when we partook of this event when were saili9ng on the RMS. T he food looks reeally good and the kitchen and chefs so clean and precise with the dished tjhey prepared. Makes one feel hungry..
Like to see more photos of tyhe sights on the ISLAND so we can let our friends and rtelatives see what we experiences. A very good advert for the Island. e.g. Napoeloen’s grave and Houses where he stayed when in excile from France. . Diana’s Peak, Sandy Bay and Rudolphs bay and of course the Jacobs Ladder. Thanks for the comment Neville and Jean. It’s always a curious moment I think all us passengers sitting in the sun lounge while the crew ‘abandon ship.’ Thankfully just a drill! More sights of the island will be coming later once we return to the island. Have your friends sign up for the blog and they can then enjoy our Breeze magazine, all about St Helena. Cheers. I was on Voyage 215 last year and it was a memorable experience. With my wife Elaine we travelled from Cape Town to St Helena and on to Ascension. It felt like home from home with everybody so friendly. So much so that I have a number of Facebook friends now from both passengers and crew. Being a bird watcher for me watching the Albatross gliding over the oceon hours on end was a highlight. Also a film crew were aboard making a documentary on remote islands and I did my bit to camera. Hoping to be on the LAST RMS cruise next year. 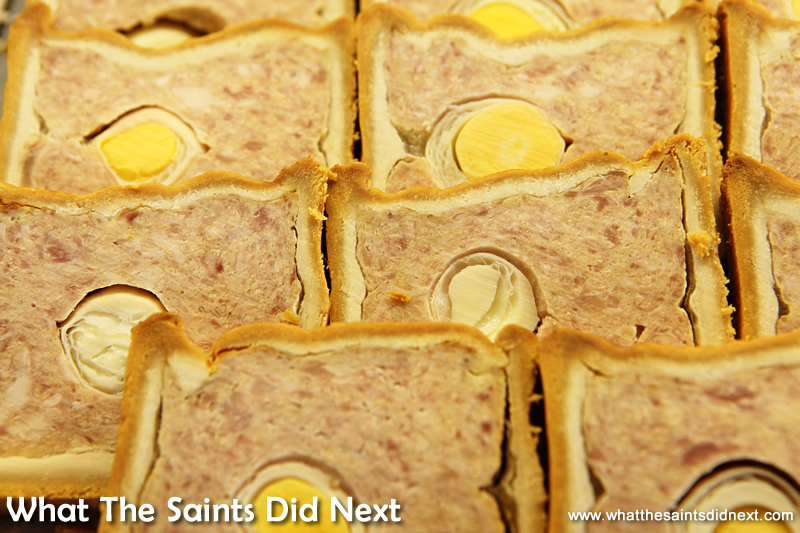 Love the Saints! Lovely comment Keith, thanks – the RMS does create some wonderful lifelong friendships for many of us. I missed the albatross this time, never seemed to be on deck at the right time but I was told it was there. That last cruise will be a hot ticket! Cheers.